Almost like clockwork, our research team, at Technical Traders Ltd., predicted on September 17 the US stock market would turn lower and attempt a 5~8% downside move on or after September 21 headed into the US mid-term elections. Our analysis of the potential downside move was related to our price modeling systems expectations that a common predicted downside target existed between -5% and -8%. Our researchers did not believe the markets would fall much below -10% before hammering out a price bottom and finding support. Today, we wanted to alert you to the fact that we are just 7~10 days away from the US mid-term elections and if our predictions hold true, we will be establishing a price bottom in the US stock markets over the next 5+ trading days and begin a new upside price rally fairly quickly after the election results are known. We could interpret this as “a period of uncertainty that is mixed with economic and news data” which results in investors pulling out of the markets ahead of these types of global events. In all reality, the US elections are really a global event for many investors. Policies, regulations, taxes, objectives, and execution become a very big question for many as these elections take place. Hundreds of billions of dollars are exposed to risk in the weeks headed into US elections and, thus, global investors and traders are always cautious headed into a major US election. Our theory is that this phenomenon has become even more volatile in recent years and global political ideals have become further polarized. We believe when a sitting US president that has served for two terms is leaving office, far greater volatility enters the global markets typically. We believe that mid-term US elections, depending on the political climate at the time, may or may not reflect in broad global market concerns and volatility. 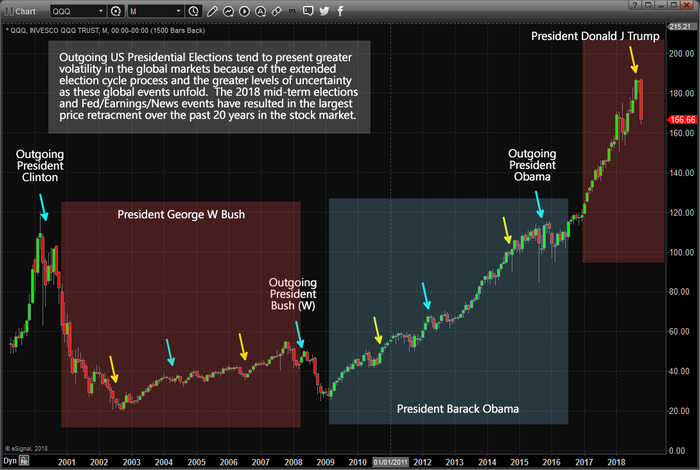 We've highlighted major US Presidential elections and US Mid-Term elections on the chart below so you can see how volatility and price rotation increase or decrease depending on the political climate and uncertainty associated with these US elections. We've highlighted 6+ months (or longer) before Presidential elections and a few months before mid-term elections. The current election event, November 6, 2018, is somewhat unique as it also coincides with the US Fed having raised FFR rates considerably over the past 2+ years as well as after a dramatic price increase in the US equities markets following the election of President Donald J. Trump. You can clearly see from the chart below that the QQQ has increased by nearly $80+ over the past two years while that same $80 increase existed over the entire Obama stock market recovery (8 years). This reflects the amount of increased volatility and activity that is within the current global capital market. 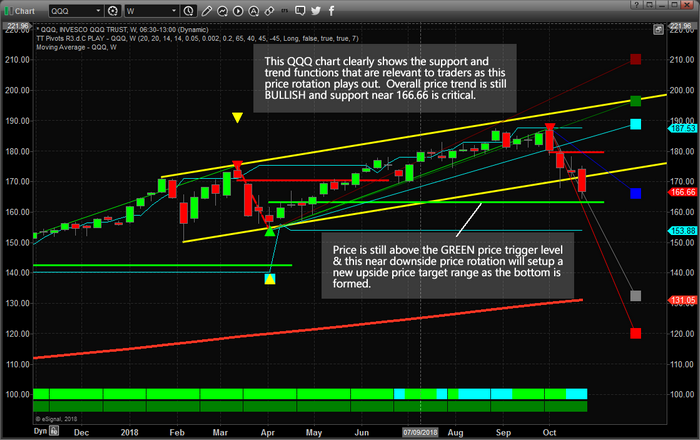 This QQQ Weekly chart highlights what we believe to be the core elements of this election cycle rotation. On this Weekly chart, the overall price trend is still BULLISH (see the DARKER GREEN blocks near the bottom of the chart) and the bullish price trigger level near $163 is still valid. Yes, the shorter term price trend is currently BEARISH and has been so since the week of October 8. You can see the bearish price trigger level near $179 (in red) that was recently breached and the downside price target level (in blue) near $166. Our expectations from our predictions that the markets would be rotated lower by 5~8% were that the markets would move towards the lower YELLOW price channel level and stall near these levels (or just below these levels). We did not expect the extended price decline that was a result of earnings data and housing data being released last week. We still believe this move has already reached its downside objectives and is in the process of setting up a major bottom formation. We believe the extended move was an emotional price reaction to a hyper-election environment in the US and extended anticipation of caution in the global capital markets. In the next segment of this research article, we'll take a look at additional technical, price and modeling systems that support our belief of a major bottom formation setting up in the US equity markets and how election cycle events should be played for success. This current downside price rotation has extended to below our expected levels – much like a deeper “washout low” price formation. We continue to believe the next 7+ trading days will hammer out a bottom formation and that the US equities markets will resume an upside advance shortly after the elections are completed and throughout the remainder of 2018. Please take a minute to visit www.TheTechnicalTraders.com to learn more about how we help our members find and execute success and how we can help you navigate these market rotations. Our predictive modeling systems called this move nearly 4 weeks in advance and now they are calling for a bottom to set up near November 10th and a price rally to resume throughout the rest of 2018. If you want to find out how these incredible tools can help you find and execute better trades, then visit www.TheTechnicalTraders.com to learn more.